If you’re looking for a robust conveying solution to meet the needs of the modern fruit and vegetable handling and processing industries, mk North America offers a number of conveyor systems ideal for such challenges. mk’s CleanMove stainless steel conveyors are particularly well-suited to perform as fruit and vegetable conveyors. Keep reading to learn more. Economic growth, increasing global per capita incomes, and rising consumer spending are all contributing to a boom in demand for a huge number of consumer products and other commodities. Fruit and vegetable industries are no exception. In the U.S., rising incomes and increasing diet and nutrition education are expected to increase domestic demand for produce, while growing global consumption is expected to be a boon for the export market as well. Challenges Faced by the Fruit and Vegetable IndustriesBut with increasing demand comes increasing challenges for fruit and vegetable producers and processors. Some challenges are far from unique to this sector: growing competition, environmental concerns, employee overhead, and others. Unlike many products though, fruits and vegetables face the imminent threat of spoilage and need to be handled and processed quickly. This puts a great burden on production lines to be quick, effective, and sanitary. The need for sanitation extends to another of the challenges particular to fruit and vegetable production: government regulations regarding consumer health and other compliance issues. Regulations like the FDA’s Food Safety Modernization Act (FSMA) impose strict guidelines on fruit and vegetable manufacturers in order to prevent contamination and protect consumer safety. mk CleanMove Systems as Fruit and Vegetable ConveyorsCleanMove stainless steel conveyors from mk North America are ideally suited to meet many of the handling and processing needs of the fruit and vegetable industries with these challenges in mind. Made with sanitary stainless steel, CleanMove conveyors are designed to meet or exceed FDA, 3-A, NSF, and BISSC regulations for sanitation, with washdown capabilities including a variety of cleansers and pressures of up to 1,500 PSI. Speeds of up to 250 FPM along with high load capacity and numerous framing options (straight, curved, gooseneck, z-frame) ensure rapid and efficient processing in a variety of applications. 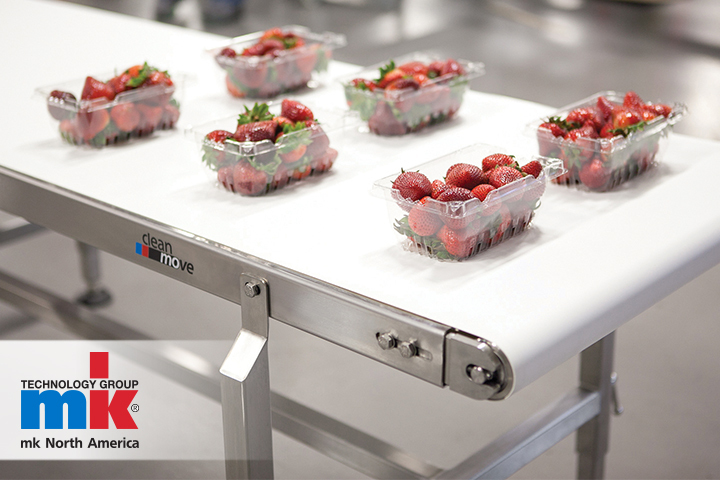 A variety of belting options such asflat, cleated, and modular plastic belts with widths of up to 48-inches ensure that CleanMove conveyors can be designed to accommodate fruits and vegetables at every stage of the processing process – from harvesting to processing and packaging. Contact mk North America to learn more by calling (860) 769-5500 or by using this convenient online form.